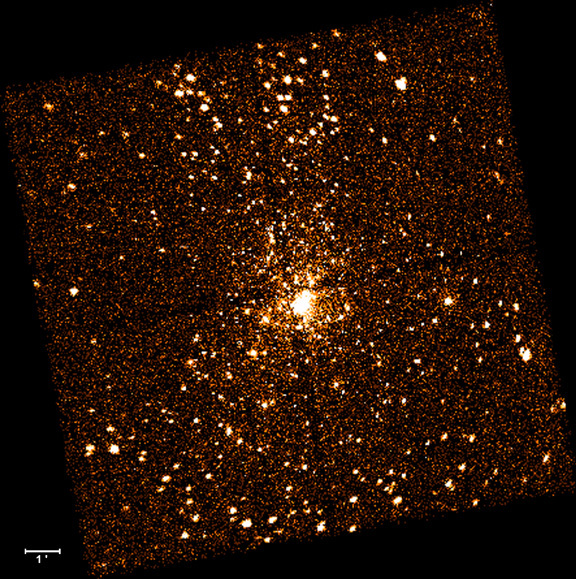 Chandra Image of the Orion Nebula Star Cluster. This X-ray image shows about a thousand X-ray emitting young stars in the Orion Nebula star cluster. The X rays are produced in the multimillion degree upper atmospheres of these stars. At a distance of about 1800 light years, this cluster is the closest massive star forming region to Earth. It is well-known in the night sky because it illuminates the Orion Nebula. The region shown in this image is about 10 light years across. 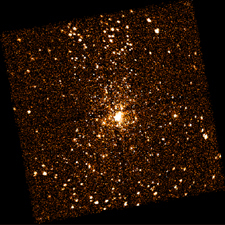 The bright stars in the center are part of the Trapezium, an association of very young stars with ages less than a million years. The dark vertical and horizontal lines, and the streaks from the brightest stars are instrumental effects.